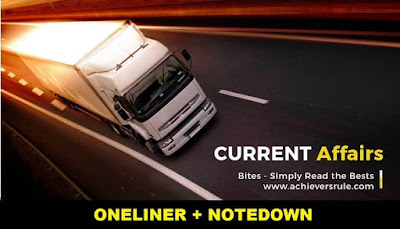 In the Current Affairs & GK Update of 8 August 2018 we cover all important National,International,Financial,Sports news, nominations, agreements which are relevant for upcoming SBI PO,SBI Clerk,SSC,IBPS RRB exams.We at Achieversrule regularly provide One Liner Current Affairs and GK Updates to keep our candidates prepared for Current Affairs section of Banking,Insurance exams and current affairs exam. The Telecom Regulatory Authority of India (TRAI) on Tuesday launched the Do not Call (DND) 2.0 and MyCall apps with the Unified Mobile Application for New-Age Governance (UMANG) platform.the products are launched to tackle unwanted calls or SMS by consumers. Italian motorcycle-maker Benelli today signed an MoU with Telangana government and Adishwar Auto Ride International (AARI), a subsidiary of Mahavir Group, for setting a manufacturing facility here. Beijing successfully tested its first hypersonic aircraft 'Xingkong-2'which has the ability to carry nuclear warheads and penetrate any current generation anti-missile defence system owing to its high speed and 'unpredictable trajectory'. Our planet is at the risk of entering an irreversible ‘hothouse’ condition – where the global temperatures will rise by four to five degrees and sea levels may surge by up to 60 metres higher than today – even if targets under the Paris climate deal are met, a study warns. According to the researchers, keeping global warming to within 1.5-2 degrees Celsius may be more difficult than previously assessed. Tokyo 2020 will be the first Olympics to deploy facial recognition technology to increase security around all venues, organizers announced.Reuters reports that Olympics organizers are partnering with NEC, a Japanese telecommunications and information technology firm, to develop the first system of this kind to be implemented at the global sporting event. The Union Ministry of Water Resources, the NABARD and the National Water Development Agency (NWDA) on August 6, 2018 signed a revised Memorandum of Agreement (MoA) for funding of central share of 99 prioritised irrigation projects under Pradhan Mantri Krishi Sinchayee Yojana (PMKSY).The funding will be done through the Long Term Irrigation Fund (LTIF). The 3rd India-Nepal Coordination meeting was started in New Delhi. Issues related to security along the border and sharing of information on criminals will be discussed and A seven-member delegation from Nepal, headed by Inspector General of Nepal Armed Police Force Shailendra Khanal will take part in the three-day meeting. The Union home ministry has excluded 29 inhabited islands in Andaman and Nicobar from Restricted Area Permit (RAP) with an aim to boost tourism. Foreigners are not allowed to enter most of the hundreds of Andaman &Nicobar islands and they are required to obtain a RAP to visit the islands. Dravida Munnetra Kazhagam patriarch and former Tamil Nadu chief minister Muthuvel Karunanidhi has passed away.The 94 year old stalwart had been battling ill health for more than a year ,not long after he was elected to the assembly for the 13th time in 2016. Present Chairman of TRAI: R.S.Sharma. TRAI was established with effect from 20th February 1997 by an act of parliament called TRAI act. Benelli is an Italian motorcycle manufacturer. Olympic 2020 will be organised in - Japan. Currency of Japan: Japanese Yen.